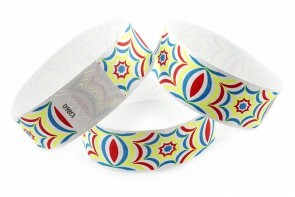 Hypnotic Tyvek wristbands for party and event security. Waterproof and numbered to help with inventory. 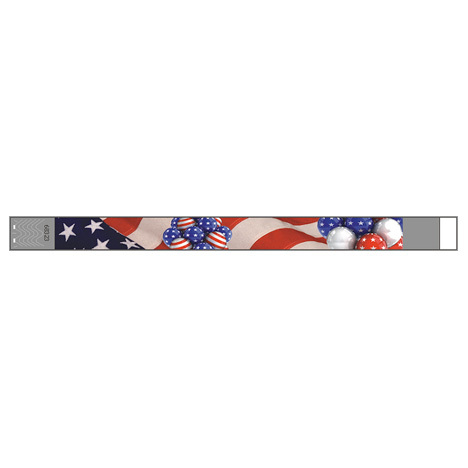 Hypnotic Tyvek wristbands are truly one of our most popular patterns and is one that is really loved by many of our clients. The 1" x 10" size and bright colors, along with the easily recognizable pattern, make it easy for security people to see the band from a distance and not have to unnecessarily approach your patrons. Tamper proof slits, backed by an aggressive adhesive create a secure closure on the Tyvek wristbands. Each box of 500 come pre-numbered for excellent inventory control. Because of the simplicity of forming a circle around the wrist and adhering the adhesive end, these wristbands will fit an adult, or a small child. Your security people simply remove the covering from the adhesive, wrap the wristband around the wrist, and adhere it onto itself. If someone tries to peel it back in an attempt to transfer it to another person, the adhesive holds on to the band and the tamper proof slits shred the tyvek material apart making reuse almost impossible. The tyvek wristbands are perfectly at home in the water and are intended for 1 day use, although if not totally abused, can last much longer. 1 Quantity = 500 Wristbands. Quantity Discounts start at 10 boxes and are automatically configured in your shopping cart upon checkout.